Tuesday was incredibly windy! The gusts were so loud it sounded like the roof was going to blow off the house a few times, and it was hissing through the kids’ bedroom window tot he point that they were getting a little put off. Apparently these were abnormal winds (trade winds, maybe? ), but they lasted 2 full days. We didn’t even sit outside in the evenings after the kids were asleep as it was so windy and chilly (the good news was the bugs were kept away with the wind). We started the day on the east coast. We first stopped at the Wailua Falls, one of the many gorgeous waterfalls on Kauai. 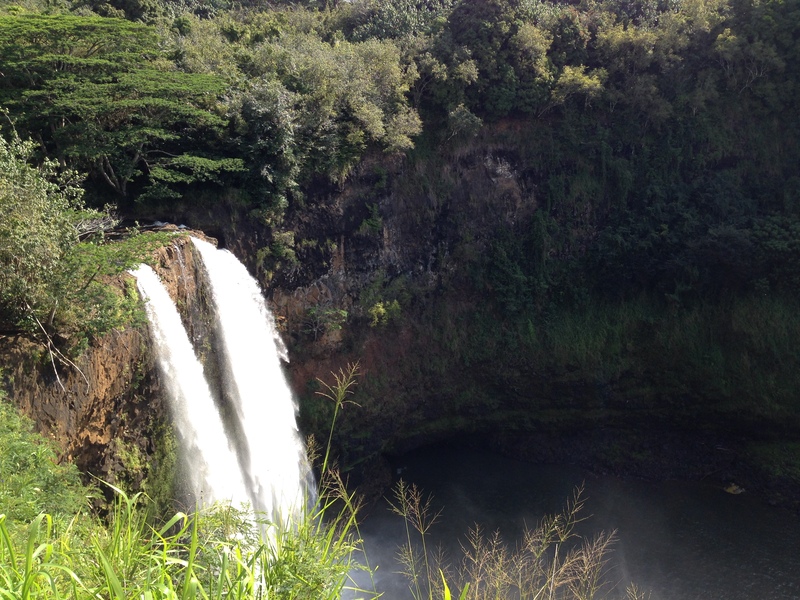 Like so many beautiful attractions on Kauai, it was just a quick (free!) stop off destination. Most of us appreciated the view, but Hayden was upset because we’d originally thought we were going to go Na’Aina Kai Botanical Gardens and told him there was a fun kids area, but we couldn’t get reservations for the kids’ tour in the morning so had to push that to the next day. So the falls seemed a bit boring to him in comparison, but luckily for him there is not too much to do when viewing a waterfall – however beautiful – to keep you there too long. 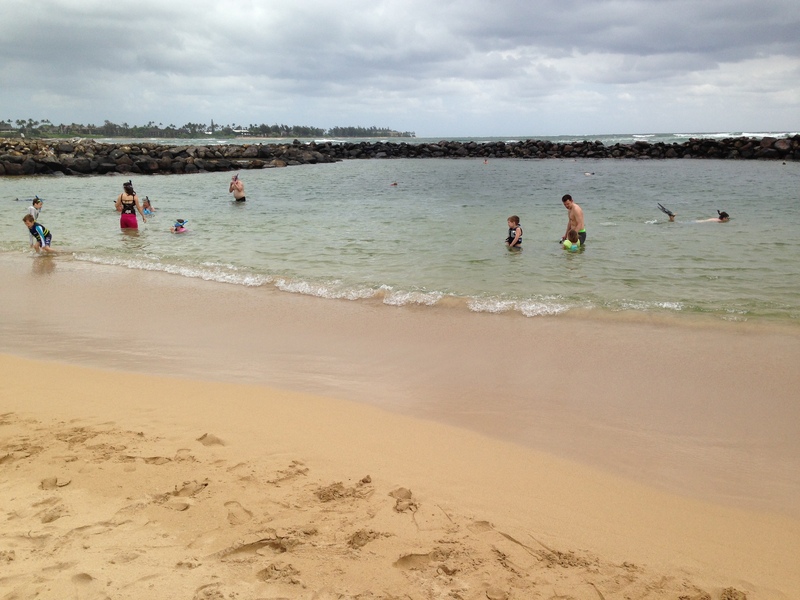 We headed on to Lydgate Park and Beach. 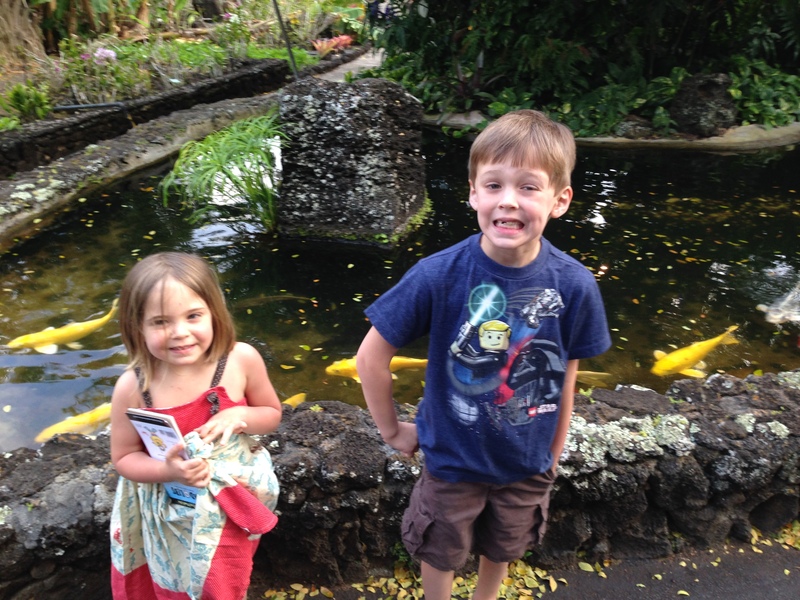 This is a MUST for any family with kids visiting Kauai. Hayden still says this is his favorite part of vacation, and as we were leaving the park he asked when we could come again. 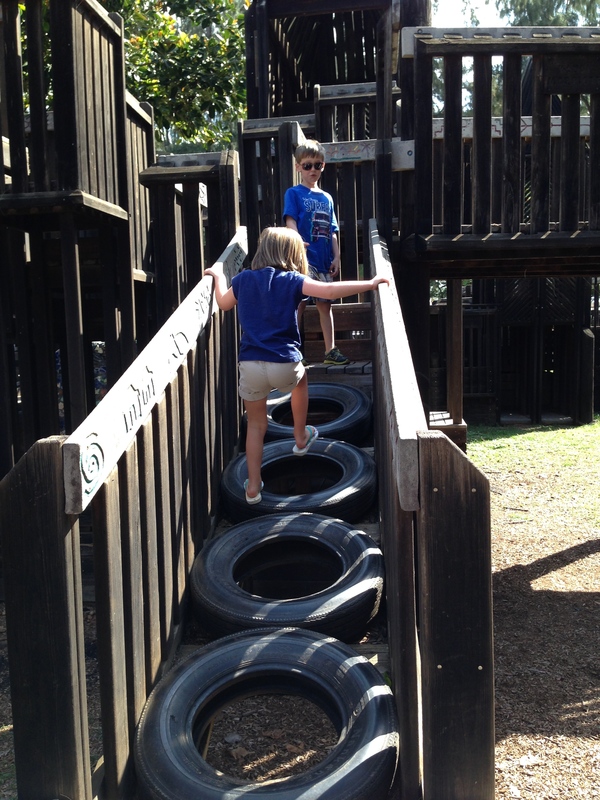 They have a fantastic, huge playground that the kids had a blast exploring. Unfortunately, we got our timing a bit off as it happened, and did the playground while it was lovely and sunny and tried the beach after it clouded over and eventually rained for a while. I mentioned in my last post how crazy windy it was for a couple of days – add those enormous gusts to clouds and a bit of rain and it was downright cold while we were on the beach! Apparently the water was cold too (it was nearing lunch and with the weather as it was I didn’t even bother changing into a swimsuit). The kids and John spent a bit of time in the water – there was a nice little lagoon made by rocks to keep the water calm, similar to the day before. The kids were over it after a few minutes, but John stayed in to do a little snorkeling. He didn’t realize it had started raining, so we took cover under a tree while we waited for him – he got a new backpack with 700 compartments and it was easier to wait for his return than trying to figure out where the keys were. We headed back south for lunch. John and I went to the Koloa Fish Market to get some delicious fish for lunch, which we took back to the condo to eat while the kids had some sandwiches. Layla helped herself to some of the edamame we had gotten (she approved). I had their lunch special which was 3 generous pieces of 2 kinds of fish (ono and ahi) with various sauces I selected, some wonderful macaroni salad, and sushi rice. It was excellent – but so big that I had to save the rest for another time, but it was just as great a couple of days later! John got a seaweed salad and a scallop salad which he said were awesome. We thought we were having pictures in the late afternoon so we didn’t want to venture too far after lunch. We hit the pool and hot tub for a little while. After we were all cleaned up and ready for the photos the photographer came by to check if we wanted to try in a couple of days when the winds wound down and it wasn’t so dreary. So since we had a bit of time given to us we went to Kukui’ula Village Shopping Center. I had failed to bring anything warm and wanted to get a long sleeved shirt/souvenir. We all ended up getting Kauai/Poipu shirts, and I love mine so much I want to go back to get another different but similar one. For dinner we went to Plantation Gardens Restaurant. It took a while to figure out where to park – it’s part of a resort and it’s not obvious where the restaurant part is. But to get to the restaurant you have to walk through their gorgeous gardens. They had huge koi fish the kids enjoyed seeing and talking to. The food was superb and the restaurant was very pretty. And again by the time we left the kids were nearly ready to crash out! I was not far behind them – I didn’t even make it to 9 before I was asleep watching tv. We are filling our days to the brim and combining that with whatever is left of jet lag makes for hearty sleeping!